I have, over the years, tried various things to lose weight and nothing stuck. My doctor tried to help me accept my “normal” heavier body, but it just didn’t seem right. Then I found Jameson Skillings and ProCoach. A year ago I quietly committed to totally own my health by agreeing to work with him for 12 months, the scheduled duration of his program. Because the program was online, I could do it from anywhere. Good for lots of reasons, and especially because it took away any excuses I tried because “I was traveling on business”. I could never have predicted my health journey success with the help of Coach Jameson. I also had amazing support from my family and a few really good friends who I let in on my secret journey. Thank you for being there with me. The outcome has been a remarkable transformation. My jean size went from size 14 to size 4; I’ve lost 28 pounds and 40 collective inches. I am stronger and have more energy than I have in years (as evidenced by all that dirt I moved into the new garden!). I learned about nutrition and habits that make this a lifestyle, not a gimmick. And I was able to stop taking cholesterol medication. Throughout, Jameson guided me, supported me, modified my workouts during a period of injury and helped me find my own path. My response: most important was the consistent and frequent feedback from my coach based on my lessons, realistic reminders of the long-term perspective and appropriate goals, and Jameson’s flexibility to join me where I was at various stages in my journey. No lectures, no judgment, just super-solid and highly knowledgeable input and support. Daily emails, with lessons and accountability to learning habits and doing workouts. Great photo examples and video education on the exercises, how to do them safely, and how to modify them as needed (Yup, could do them in my hotel room with no special equipment. No excuses). Basically, this was the easiest VERY HARD thing I’ve ever done for myself. 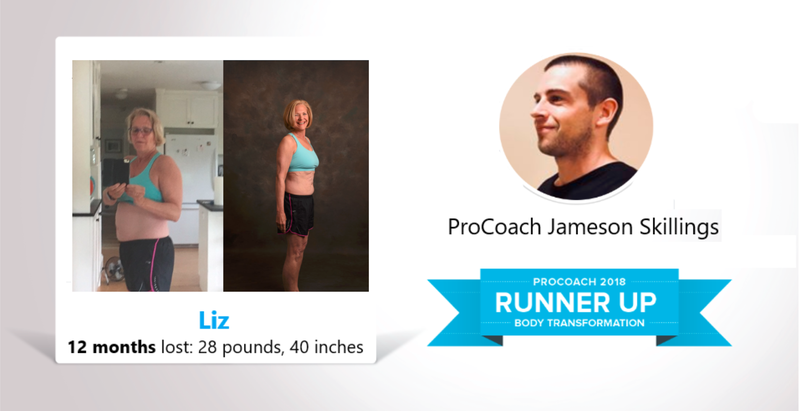 Liz had such amazing results that she was a prize winner for the 2018 Precision Nutrition Body Transformation Contest. Do you want similar results? Contact me today. I started working with Jameson because I was in his fitness classes and I found him to be professional, caring, and convincing about meeting my goals of losing weight and reducing my diabetes medications if I worked with him. I'm SO happy to have lost 30 pounds and because of Jameson's teaching and support, it has stayed off! Not bad for a 72-year-old! I'd highly recommend Jameson because he has truly become my partner in the quest, he has made it doable for me by offering all the support I needed. Right away, I figured out I needed to shift my mindset after Jameson sent me a message that said he was looking for me to learn new habits and invest in making changes because I am worth it, and not just because there was a cash prize on the line. I started to think about how many times I have done this exact thing. Entered a challenge, dropped 15 pounds by depriving myself and beating myself up with negative self-talk and then gaining it all back after the challenge by binging on all the foods I had cut out of my diet. I don’t ever want to do that again. In fact, I don’t ever want to go on a diet again. I learned that I have been eating WAY TOO FAST. My day is busy and fast-paced, and I am often standing at my desk scarfing down my breakfast or lunch while furiously typing on my computer. Being mindful during my meals makes a big difference -- I was eating less food and feeling more satisfied after my meals. I was also choosing foods that I was craving and not food that I just thought were ‘good’ choices. I ate meals that sounded good and just ate them until I was 80% full. That doesn’t mean that I swapped out my salad for pizza and fries, but if I wanted to add a few bites of pasta salad to my veggies because it sounded good, I did. I just ate is slowly, and with intention, and paid attention to how I felt before, during, and after my meal. There are no ‘good’ foods or ‘bad’ foods. It's about balance and listening to my body. I don’t feel good when I eat six cookies, so there is no need to do that. My sweet tooth is satisfied with one. I don’t have to eat salad every day for lunch just because it’s ‘healthy.’ If a salad doesn’t sound good, I can switch it out for some roasted veggies or a hearty vegetable soup. It is important to listen to my body and make compromises. I am everyone else’s #1 fan, but I was my own worst enemy. Working with Jameson, I started to actively practice compassion and radical self-acceptance. Losing weight has always been a challenge for me. Small sustainable changes will get me where I need to go, even if it means that I am looking at more of a marathon than a sprint. I can’t tell you how many times over the 6 weeks I said to myself, ‘Just 1% better,’ which has translated to one less beer, or 10 more reps, or 1,000 extra steps. That 1% is realistic, achievable, and sustainable. It is a gentle reminder to continue improving every single day. And that 1% adds up. My relationship with food is changing in a way that it never has before. Working with Jameson has started me on a path of transformation. Skis without pain now and can keep up with his son on the mountain. Jameson is very approachable and respectful, which is important when people are dealing with sensitive (overweight) or painful (reconstructed right shoulder, significant limitations, and some pain). I wanted to improve my cardio-respiratory fitness and get a better range of motion and balance. I'm an avid skier and being able to keep up with my son who is in his 20's is a huge deal for me. Thanks to my hard work with Jameson, I was able to ski the Grand Montets (almost 7k' vertical) with no hip cramps, which is a major change just from last year while having a noticeably better hip range of motion, more comfort (and less discomfort) when doing physical activities. I appreciate Jameson's supportive guidance and help, as we are all on a wellness journey but we are also busy at work, parents (that never ends! ), friends, members of the community. We have so many responsibilities, and many of them are wonderful, but it is hard to fit it all in and Jameson's understanding and support help me feel less stressed. I don't need my fitness to be another thing to do. I need it so that I'm healthy and able to be active with my family and friends, and so that I'm happy! Jameson does a great job of making me look forward to exercising. Before I started working with Jameson I was worried that it would be awkward working with someone of the opposite gender. That we wouldn’t mesh regarding style of coaching. That I would give up within a couple sessions. Jameson is friendly and open, and I feel like he listens to what I want to get out of training. He also listens to what I said was motivating (or not). We did exercises within my ability, which helped me to stay motivated as my abilities grew. I came to Jameson wanting to be a generally healthier person. I wanted to be able to walk up stairs at work without getting winded. Now, I no longer get winded! I lost more than 20 pounds, but mostly inches because I reduced my body fat percentage. I have better posture, I sleep better, I even eat better. My endurance playing bagpipes is longer. Have more control of my bag. Have bought several large sized shirts instead of my usual extra large. Went down a bra size. I met new people and made several new friends. One of my classes I took consistently was with Jameson Skillings, week after week he would start conversations asking about how I was doing, what was I looking for in a workout, and slip little tips in for modifications or things to try, week after week he would smirk and jokingly mention that he now offered Nutrition Coaching. Multiple times I was sure I was going to join that nutrition and coaching program and week after week I would talk myself out of it and Jameson just kept asking questions, giving encouragement and offering these little tidbits of nutrition and exercise. He was patient, never pushy, always available for questions. Then he announced he was doing a 6-week transformation program and I thought ‘how perfect, I get to try this program out, lose a little weight, and if I don’t like it, no big deal'. Little did I know what I would gain while I lost the weight. Customized exercise routines in hand and an approach to meals after reading the information packet and speaking to Jameson I started the program. At first, I was determined to be PERFECT. Get every workout in eat “healthy” and do it until the program completed! Ha! As always best-laid plans and all that. I worried my form wasn’t perfect, I worried my macros weren’t perfect. I spoke with Jameson in person and during live chats he always was calm, he kept talking about how I needed to be able to do my workouts and eat and still enjoy and live life. That it’s not about being perfect it’s about enjoying where you are in life while still being aware of what you are eating, how you are moving, and how you are feeling. and I even agreed but I still wanted to be perfect. I work full time in the health field and my life was getting crazy. Two weeks of altered schedules eating out and on the road and celebrations, not meal prepping and having to skip my usual spin classes and weight routines and I was in a mental spiral. Oh no, I wasn’t perfect! However in the back of my head was this voice repeating over and over again, eat until you're 80% full, make the better choice you can in the situation, you don’t need to have a gym to workout, enjoy the moments life has to offer. I got back from a quick trip in time to go to Jameson’s Saturday class. I smashed, I squatted, I laughed, and socialized. Then we had to do pushups, I did 21 modified push-ups with relatively good form and the lightning bolt hit me! I hadn’t been perfect for 2 weeks but I had been consistent for 5 weeks, I looked back at my food choices and I had made far better choices than I would have a year ago, I had created new habits of eating slower stopping before I was overfull, had gone for long walks instead of spinning had used a resistance band from my suitcase instead of weights and I was strong! Two weeks of non-perfection had not destroyed 5 weeks of consistency and commitment. I still had the knowledge and the ability to pick back up, remain consistent, and I had LIVED LIFE. What a great discovery! To cap it all off I had 3 people ask me after six weeks what I had been doing to get the definition in my arms and my legs. I feel amazing I am so thrilled with the way I feel and that I have the ability to slow down enjoy my food and not feel deprived. Jameson has the ability to make you feel you’re concerns are not inconsequential. He is present in every conversation even when that conversation has more than one person involved, patience, humor, the ability to offer suggestions but encourage you to think it out for yourself, often you will start to answer your own question even before you have finished asking it. Jameson your commitment to health wellness and enjoyment of life is contagious, this journey has been amazing and I am looking forward to learning more about myself and my health in the future. I chose to work with Jameson because I appreciate his knowledge of nutrition and fitness. I feel very safe working with him, knowing that he will help me avoid injuring myself by using correct form and making modifications as needed. When I came to Jameson, I wanted to lose weight and regain my health after a scary diagnosis. 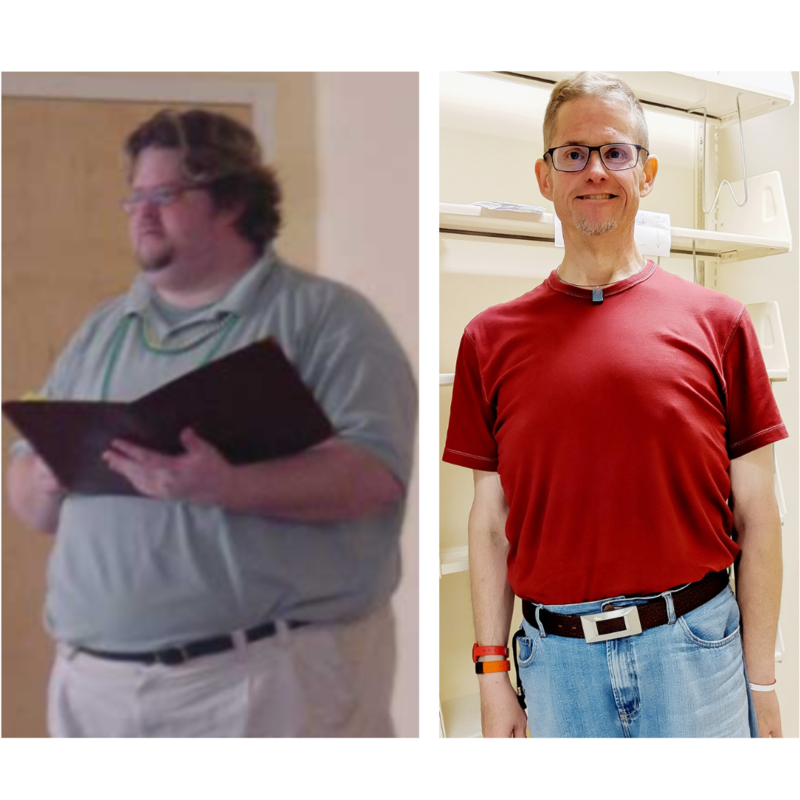 In less than a year, I'm down over 110 pounds, went from a BMI of 53 to 33, and I've developed new eating habits such as eating slowly and stopping before I feel full. I'd recommend Jameson because he is amazing! Jameson is knowledgeable, approachable, fun, very accessible for questions, and truly invested in seeing his clients be successful. In 2016, I weighed over 400 pounds. I'd had plenty of experience via WeightWatchers, low-fat diets, Atkins like diets, very low-calorie diets and fasting. In my life I've lost weight many times, so I know I can take off the weight. But putting it back on had been an issue. So, I knew that this time, I wanted to focus on something I could stick with, and which was not about beating my body into submission, but acceptance, and progress through consistency. I had experienced significant weight loss by mid-January, and was getting more active by doing cardio at the gym. 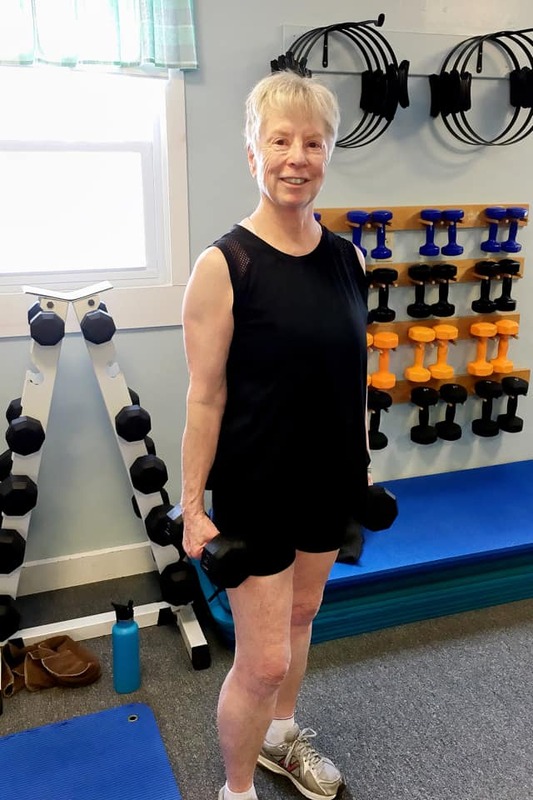 Once I got clearance from my doctor, I investigated options for strength conditioning and training in order to improve my balance, coordination, musculature, and core. I anticipate skin reduction surgery in the next year or two, and I wanted to do anything I could to make that go smoothly. I attribute my success to a combination of having a much-needed surgery and having Jameson on my team, helping me learn how to help myself, in a self-compassionate way. I THOUGHT I needed someone to walk around in the gym with me as I did exercises on machines. But what I have received through Skillings Fitness is a coaching experience that has helped me focus on making things better one day at a time, while accepting where I am today, and knowing that I have someone in my corner, thinking creatively about what would work best for me. It's also been incredibly empowering to be asked questions that I've never considered before. You know, my surgeon told me at my 6-month follow up that I am healthier than 90 percent of the country's population. He also said that physically, he sees no limitations to my abilities. It's all about attitude and mentality. I told him I am training for a 100-mile bike ride. He said that when he sees me in three months (just after the bike ride), that he would consider that I am an "elite athlete". Now, that is something I have NEVER heard before in my life. It's an echo of what Jameson has instilled in me. I am a rock star. I wouldn't be training for a century ride in September if I hadn't met Jameson. I have focused on seeing improvements in my metrics on a regular basis, and because I am consistent with my practices, I do see improvement. Jameson has also helped me accept when I need to rest, to allow my body to recover and heal. Even though I have to be focused on getting certain levels of macronutrients (and Jameson has helped me work with my weight loss in conjunction with the hospital dietitian to dial this in), I don't feel obsessed by food. And yet I still enjoy good food. I have cut numerous medications from my life. I now just take 3 pills a day (aside from vitamins and supplements). I am off all my diabetes medications, down to one blood pressure pill, an anti-depressant (dosage down by HALF! ), and a statin (mostly because I am still considered diabetic even though my blood sugars are well controlled without medication). I have more energy. I walk everywhere I go, or cycle. I am kinder to myself, and as focused on developing my mindful self-compassion muscles as I am on my core. I've even begun to explore dating again. It's a complete 180! Listen to the questions Jameson asks and take them seriously. If you don't understand or feel overwhelmed, communicate that. He's a pretty good mind/body reader, but it works so much better when you just share as much as you can with him - regular updates on progress, especially on how you feel about your routines and programs. I got what I needed, even though I didn't know what it was I needed. Jameson is a voice of calm, focused energy and curiosity that inspires me to do my best. Remember, all you have to do is do your best. Believe me, that will be more than enough. That sounds like a big ask... I know. But you are worth it. Be kind to yourself, and to each other!